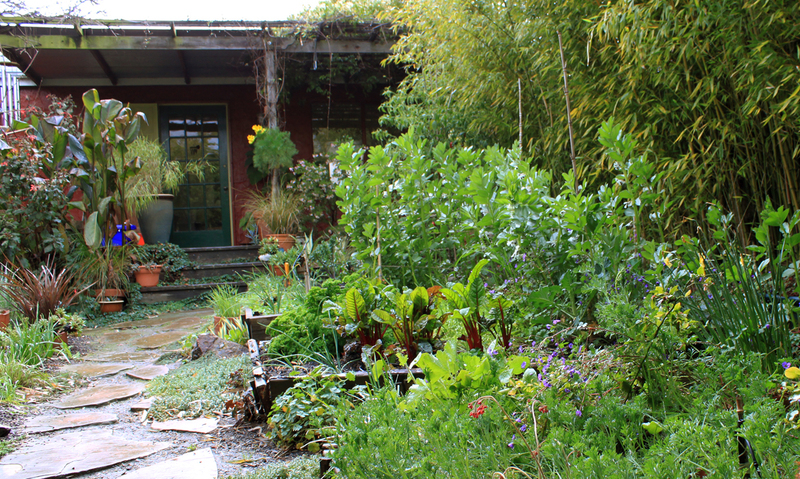 I took some photos of the garden on Wednesday during a break in the weather. Something about the light misting rain made everything look like spring had begun. The foliage on the plants was green and happy, and now today, three days later, a number of new plants are in bloom. The first Sisyrinchiums opened, the first of the species Tulips, the first Oxalis cultivar, the first of the Bearded Irises, and the first Cal Poppies on the block opened next door, with ours sending up buds. I was wondering if the warm dry January might have brought an early spring, but looking at a post from last year it seems that the plants are leafing out on a similar schedule, and looking at last year’s March bloom day post I think the bloom times are nearly the same. I’ll be able to compare on bloom day, and I’ll probably do a post later this month when more things have leafed out. 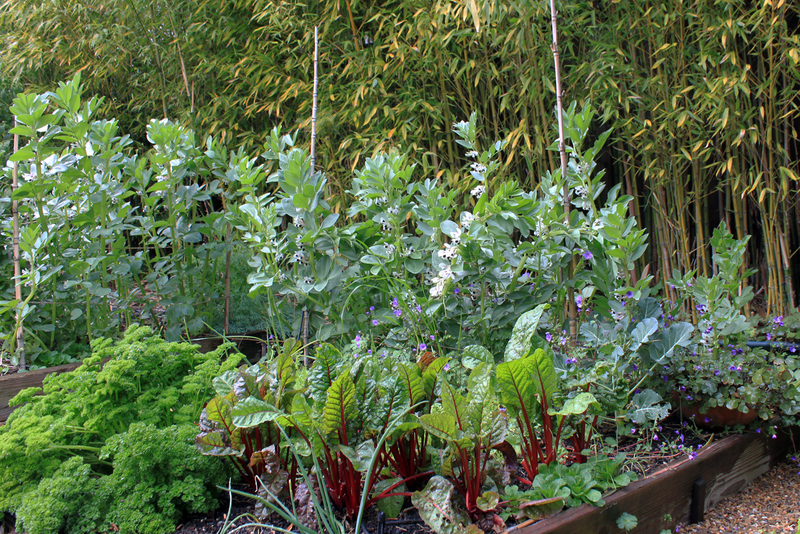 The veggie garden liked the February weather, the alternating rain and sun, and the abundance of worm juice produced by the rain. The favas were planted earlier this year, and as a result are blooming earlier too. 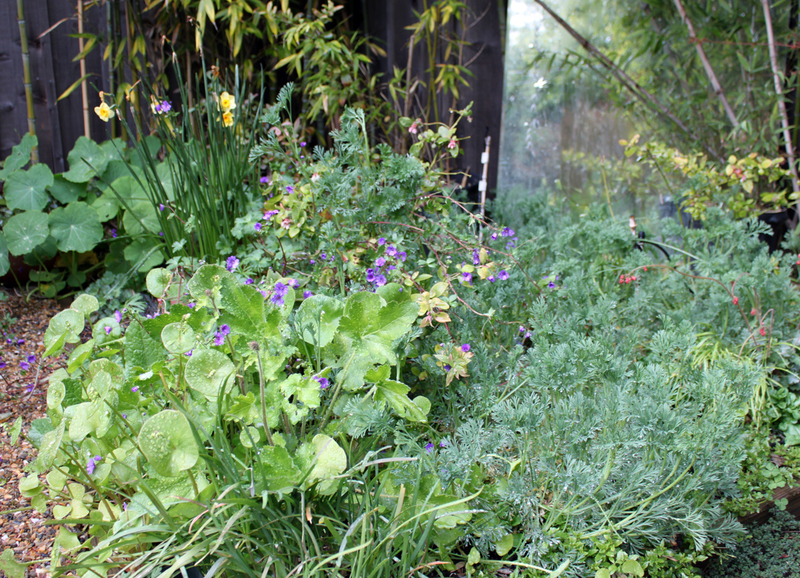 Our shadiest bed is now devoted to three blueberries and chaotic mix of Yerba Buena with reseeding Miner’s Lettuce, Mache, and Cal Poppies. 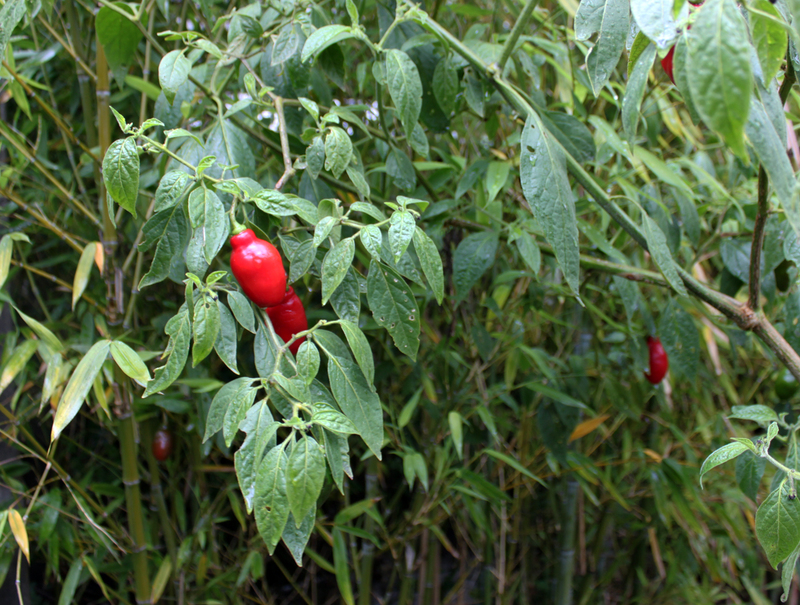 I havent been giving the Rocoto Pepper enough credit for its ornamental value. The peppers have been the most consistently bright thing in the garden all winter. There used to be more of them on the plant, but the last couple of storms have knocked a lot of them to the ground and we’ve been of course harvesting them. The red ones are hot, so we rarely use more than one of them in a single dish. Last winter the plant went mostly deciduous, but this year it didn’t drop any leaves. If it were rising out of a denser planting it would look great. 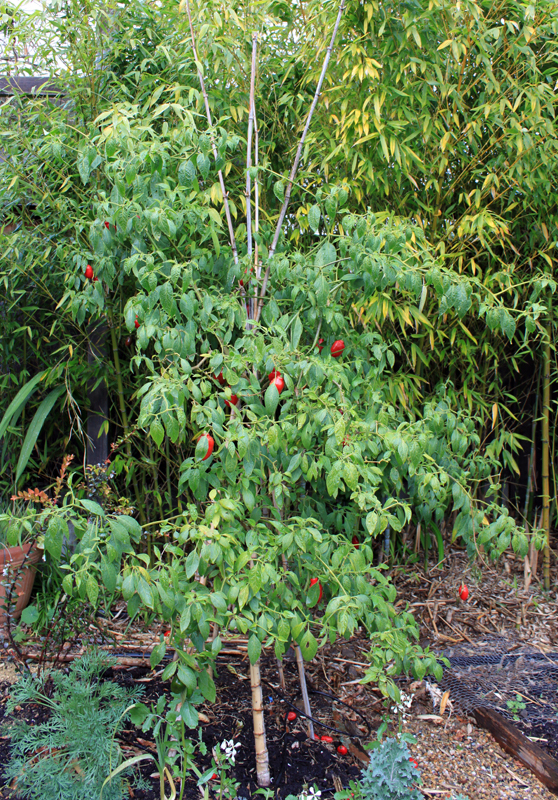 The New Zealand Tree Fuchsia has about a dozen flowers but they have the same green to red coloring as the leaves and you can’t see them unless you’re up close. It had flowers for last months bloom day, but I didn’t notice them. 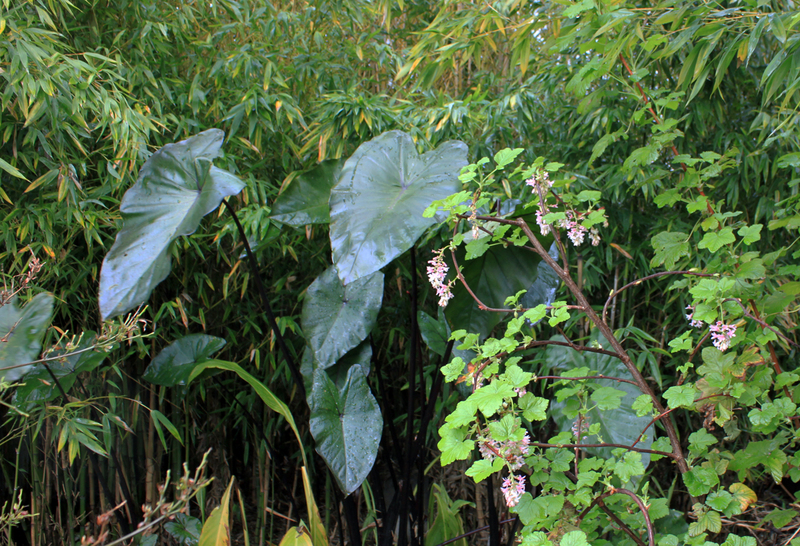 I like how the Ribes looks with the Colocasia and the bamboo. 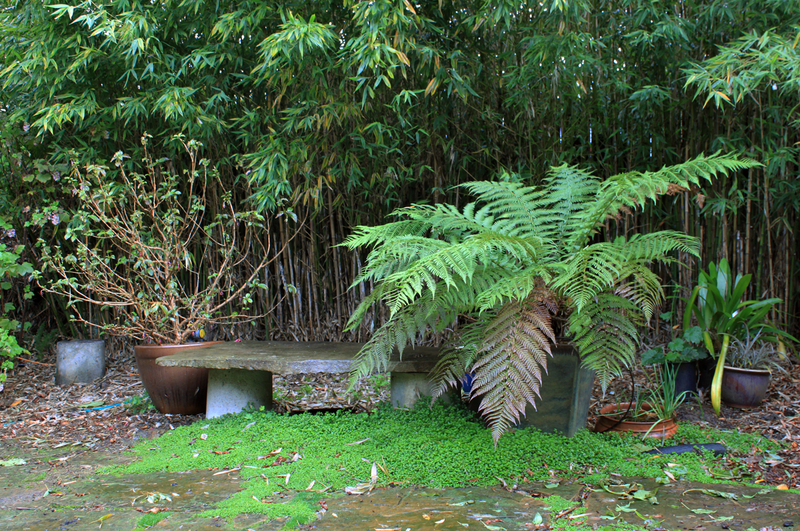 A lot of the woodland natives look rather tropical when surrounded by all of the bamboo in our garden. 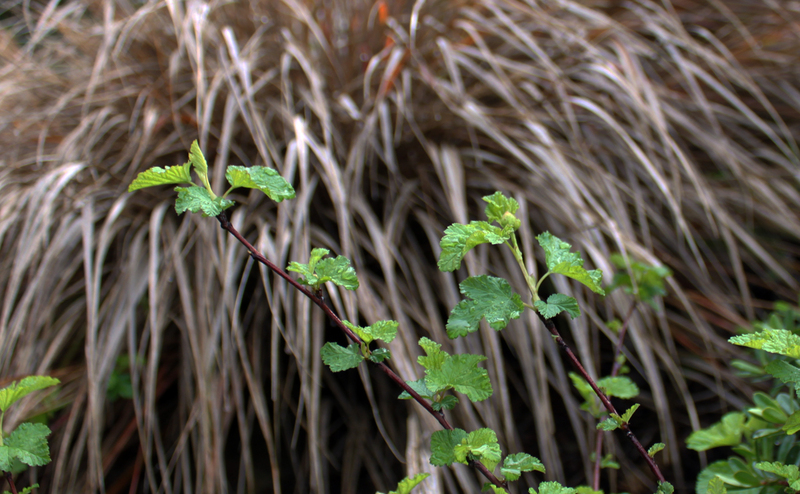 The ninebark leafed out after the Ribes sanguineum ‘White Icicle’ in the shade but before the seed-grown Ribes sanguineum in the sun. The Ribes sanguineum opened its first flower yesterday. 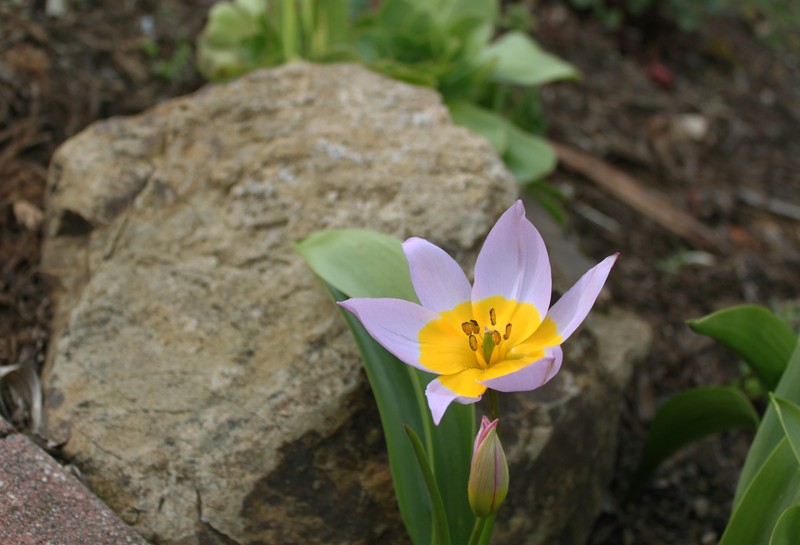 And its nice to see the first of the species Tulips opening. They are a week earlier than last year, but I think that’s because they are naturalized this year. Last year was the first time I planted them and they have about doubled in number. Pretty nice. This entry was posted on Saturday, March 5th, 2011 at 2:38 pm and is filed under edibles, plants. You can follow any responses to this entry through the RSS 2.0 feed. You can leave a response, or trackback from your own site. That looks very inviting. The species tulips look especially tempting. Maybe next year I’ll plant a few (looks like they’ll be done blooming by garden tour day in mid-April). By mid-April they’re all done in my garden, but last year they were at peak bloom in the Bancroft Garden in mid-April. I think bloom times in your garden are closer to mine than the Bancroft.